One run through of the latest from Big Boy Bloater will have you joining him wading through the Louisiana swamps fighting grouch gators and downing home made moonshine whilst keeping an eye out for the law (who, of course, are idiots). The thing is, ol' Bloater is from Surrey, not Alabama, but boy can he hold his own against any bluesman from across the Atlantic, with 'Luxury Hobo' reinforcing what is already an iron clad reputation. As well know, the blues come in different shapes, from the traditional slow, languid guitar workouts to the plethora of blues based rock bands fro Whitesnake upwards. Big Boy Bloater floats somewhere inbetween, capable of rocking out when he wants to, but happy to sit back and let an impressive solo float above a simple riff. Opening track 'Devils Not Angels' is by far the most upbeat, and a bit misleading as a guide to what's to come. With a fast pace that keeps up with The Georgia Satellites 'Railroad Steel' it's a great track, followed by the more traditional 'It Came Out Of The Swamp', itself a hard, heavy take on the traditional blues riff-o-matic machine. From there on things do calm down a bit, although the quality is still high. 'I Love You (But I Can't Stand You)' is a highlight,as is the Santana-esque 'I Got The Felling Someone's Watching Me'. 'Robot Girlfriend' is a fun song that bounces along nicely with a great solo in the middle, whilst closer 'Not Cool Man' is another upbeat track with some delicious slide guitar. Through it all, Bloater sings with a cool, gutteral growl that perfectly suits the music. Seriously, play this to anyone and they'll do a double take when you tell them it's a British band. 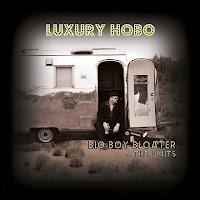 'Luxury Hobo' is a slam dunk for fans of Bloater and the blues in general. It's just so cool and fun and laid back all at the same time it's hard to dislike. Some may find the slower songs a bit harder to love, but it's a good template for exactly what the blues should be when played by someone who has a love of the genre and the talent to show that love.